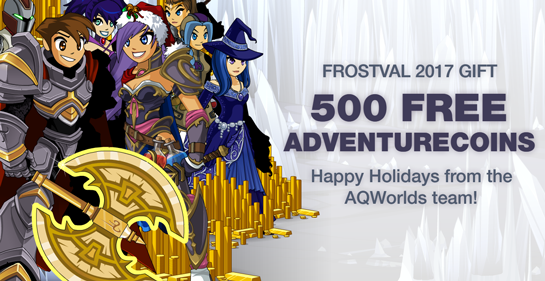 Get Your 500 Free AdventureCoins for Frostval! Every year, we award free AdventureCoins to all of our heroes who have been battling alongside us through the winter events... and this year is no exception! On Friday, December 22nd (just in time for Frostval!) we are giving 500 FREE AdventureCoins to eligible heroes as our way of saying "thanks!" for logging in and participating in the releases we've created for you! ACs will be awarded starting with tonight's release. Heroes who did not get a mute or ban for 24 hours or longer in 2017 are eligible for our Honorable Hero award! They are what true in-game heroes and role models are, and will receive a new character page badge for the 2017 Honorable Heroes!